Restaurant-style soft and buttery garlic breadsticks that are also low carb, keto-friendly and gluten-free. 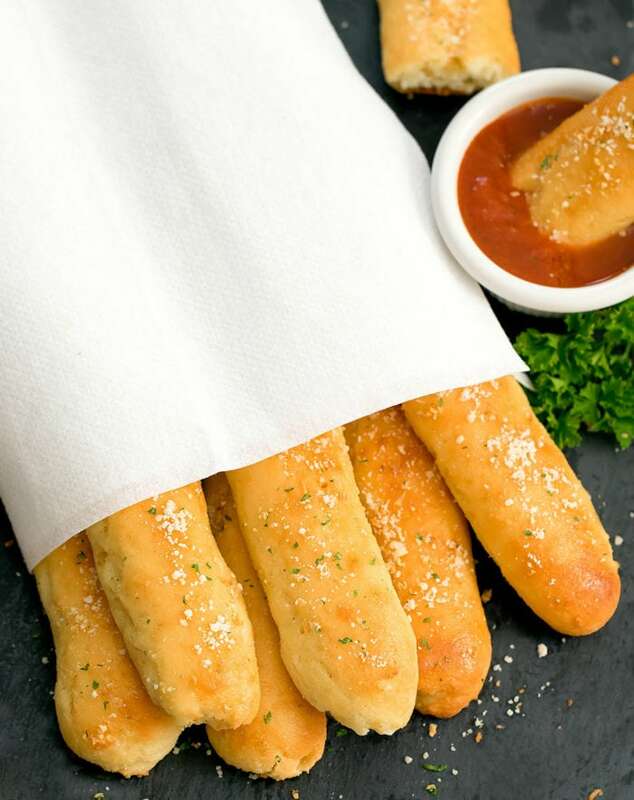 These breadsticks are delicious! 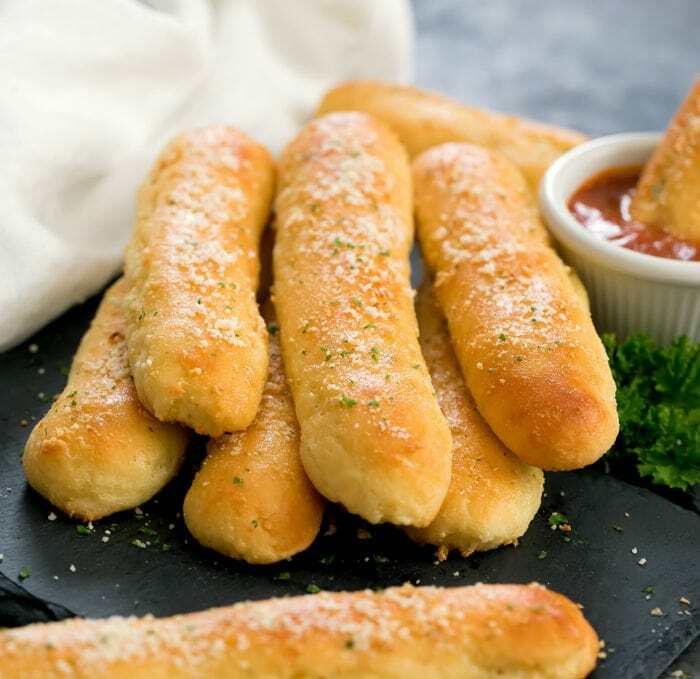 When I think of breadsticks, I think of the ones that are served at Italian restaurants at the beginning of a meal. Fresh and hot from the oven, covered with garlic, butter and parmesan, and super soft when you bite in. When I started making low carb breadsticks, most of the recipes I came across were basically low carb cheese-topped bread cut into strips. And while those type of breadsticks are delicious and I make them all the time, I also wanted to make a low carb version of the restaurant-style breadsticks that come to my mind when I think of breadsticks. These breadsticks start with the fathead dough recipe with some tweaks to make the dough bake up soft and fluffy. Fathead dough is a low carb/keto dough that is made out of cream cheese, mozzarella cheese, eggs and a flour substitute. It started out as a pizza crust recipe published by Tom Naughton while he was creating the movie Fat Head. 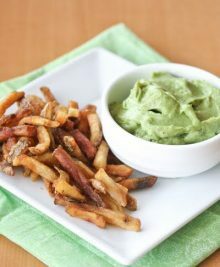 The recipe became an internet viral sensation and has since been adapted and modified for recipes beyond pizza crust, such as soft pretzels, bread rolls and bagels. FULL FAT CREAM CHEESE- The cream cheese melts with the mozzarella and helps to create a spreadable, elastic dough. 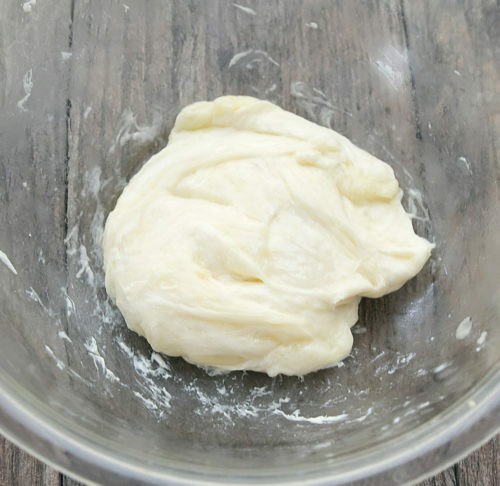 LOW MOISTURE PART SKIM MOZZARELLA- Regular mozzarella has too much moisture and will make the dough too wet. It’s also best to use part skim because there is already a lot of fat going into this recipe and you don’t want the breadsticks to be oily. SUPER-FINE ALMOND FLOUR- The super-fine texture mimics regular flour better and will prevent any grittiness. COCONUT FLOUR- This recipe uses a combination of coconut flour and almond flour to replace regular wheat flour. Each one works differently so do not substitute one for the other. Coconut flour is highly absorbent. The few tablespoons added to this recipe will prevent the dough from being too wet and will also give the breadsticks a fluffier texture. BAKING POWDER- Use an aluminum free baking powder. The recipe does use a little more baking powder than I normally use to help the bread rise. 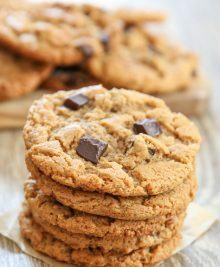 You should not taste the baking powder though and using aluminum free will help make ensure that. EGGS- The eggs act as the binding agent and create the structure for the bread. First, the cheeses are melted together. The appearance will look like a dough. The cheese dough is then blended with the dry ingredients and eggs. The best method for blending the dough is with a food processor. It is quick, easy and produces a very uniform and smooth dough. You can also roll the dough by hand or with a mixer but it will take more effort and time. The dough is then divided into 8 equal parts and then rolled out into 1-inch thick sticks. While the breadsticks are baking, you prepare the garlic butter sauce. Melt butter, olive oil and minced garlic on the stove until the garlic flavor is infused with the oils. After the breadsticks are almost done baking, they are brushed with the garlic butter sauce, and some grated parmesan cheese and parsley. The breadsticks then go back in the oven and are baked until golden brown. You can finish with more parmesan cheese and parsley before serving. These breadsticks should be eaten hot. When they cool down, the cheese condenses and the rolls become hard. You can reheat leftovers in the microwave, toaster oven or oven. 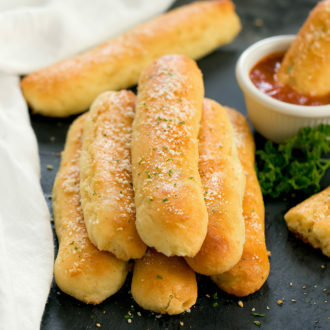 These soft, buttery garlic breadsticks taste like the ones served at restaurants, but they are also low carb, keto and gluten free. In a small bowl, whisk together almond flour, coconut flour, baking powder, garlic powder and onion powder. Set aside. Scoop out dough with a spatula and place onto a large sheet of plastic wrap. 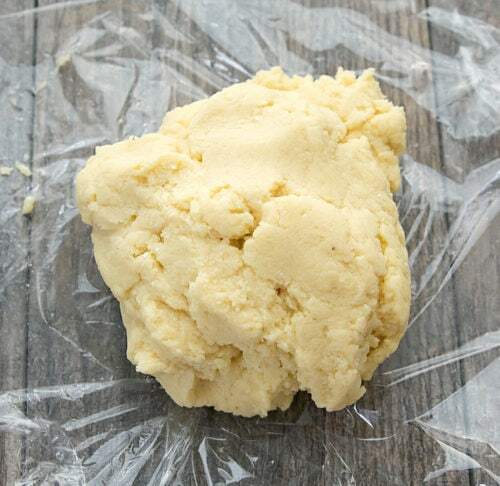 Cover the dough in plastic wrap and knead a few times with the dough inside the plastic wrap until you have a uniform dough ball. Wrap your pastry board with plastic wrap until the plastic wrap is taut. You should have the plastic wrap running across the bottom of the board so that the weight of the board will help keep the plastic wrap in place. The plastic wrap should keep your dough from sticking to the board. Lightly coat your hands with oil and divide dough into 8 equal parts. Roll each dough into smooth 1 inch thick sticks. Bake rolls for about 15 minutes in the middle rack of your oven, or until breadsticks are just cooked and just starting to brown. While breadsticks are baking, make the garlic butter topping. Add garlic, butter and oil in a small saucepan. Bring to low-medium heat and stir until butter is melted and garlic is lightly browned. When breadsticks are just done baking but still pale, remove from oven. Quickly brush them generously with the garlic butter topping (You don't want to interrupt the cooking of the breadsticks for too long.) Sprinkle parmesan cheese and parsley over the breadsticks. Place breadsticks back into the oven and bake for an additional 3 minutes or until breadsticks turn a golden brown. If desired, sprinkle more parmesan cheese and parsley over breadsticks before serving. You can serve breadsticks plain or with low carb marinara sauce. The dough can be mixed by hand but it does take more effort. The finished dough is very sticky, which is why you will need to coat your hands with oil and use the plastic wrap to help roll out the dough. As the dough cools, it will become easier to work with. You can let the dough cool a few minutes so it becomes less sticky but don't let the dough cool too long because the cheese will harden. You can use your favorite sugar-free marinara sauce. 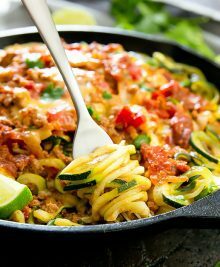 I have a low carb marinara recipe here. Nutrition estimate does not include egg wash. These made me think of the breadsticks at Olive Garden! That is what I was going for!